Legend is that this is an old pecan pie recipe originally from my family’s South Georgia roots. 1) I always use new crop Georgia pecans (pee’cans). 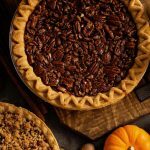 While pecans can be stored in a freezer for longer shelf life, my experience for the best pies is to use new fall crop of Georgia pecans not stored for more than 3-4 months. 2) The difference between good and best pie may be a difference of 1 or 2 minutes of leaving in the oven. Temperatures vary between different ovens and baking time is also affected by altitudes. For that, I test my pie with a toothpick and also by gently pressing the top (it should spring back!) at 50-53 minutes in. Using my oven, it is ready to come out at the 58-59 minute mark and should be set aside immediately in a cool space, like on the porch on a crisp fall day. And there you go, nothing better to cap off a fall festive dinner with a freshly baked homemade pie! Wishing you and yours a very happy and blessed Thanksgiving. Mix all ingredients (except whole pecans) and fill the pie crust. Smooth the pecan pie filling. Line the edge of pie with whole pecans. Bake pie for 40 minutes (uncovered). Tent pie with foil and bake it for another 15 minutes. Pie is ready when gently pressed in the center, it springs back! Or simply use a toothpick. Wishing you the warmest moments of peace and happiness this holiday season and throughout the coming year. May your hearts and homes be filled with joy.